Missouri Western State University has been designated by the State of Missouri as the official applied learning institution in the state. Applied learning refers to any activity outside of the classroom in which students use discipline-specific knowledge, including internships, practica, and student/faculty research. Undergraduate students who engage in applied learning get an education that better prepares them to enter the workforce or pursue graduate study. Because it is a scholarly pursuit for students, applied learning is naturally tied to faculty scholarly activities. In all disciplines, applied learning opportunities arise when students work alongside faculty mentors who are pursuing their own professional scholarship goals. 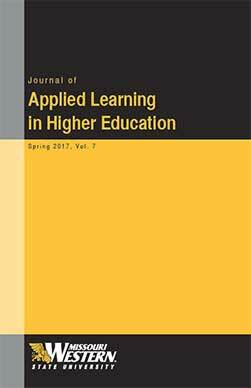 The Journal of Applied Learning in Higher Education (JALHE) is an international and interdisciplinary journal serving the community of scholars engaged in applied learning at institutions of higher education. Its purpose is to advance scholarship on applied learning by providing an outlet for empirical, interpretive, and theoretical work related to this pedagogical practice. The Program of Research, Teaching, and Applied Learning (PORTAL) offers opportunities for faculty to engage during the summer in scholarly activities that directly provide credit-bearing applied learning experiences for students. The program is intended to contribute to the growing reputation of Missouri Western as the Applied Learning University in the state of Missouri. PORTAL is expected to increase the number of peer-reviewed publications, presentations, and exhibitions with student coauthors, to institutionalize summer student research and creative activity, to increase the number and quality of applied learning opportunities for students, and to improve the culture of peer-reviewed faculty scholarly achievement. PORTAL will serve as an umbrella for all summer Applied Learning activities at Western, including internships, practica, study away, and faculty/student research and creative projects regardless of the source of funding for those activities. Applications are due before February 1, 2019. Missouri Western State University offers all students who have completed research projects (Literature Reviews or Empirical Studies) during the last year to participate in a poster session. This poster session provides an excellent opportunity to share the results of your research with a varied audience. It also provides a chance to explore research in a variety of disciplines. The Fall 2019 MRD is scheduled for Wednesday, December 4th, 2019 from noon to 1:30 pm in Fulkerson Center. The Conference on Applied Learning in Higher Education (CALHE) provides a venue for scholars, practitioners and students to gather and share their work. The 2019 CALHE will be held at MWSU in St. Joseph, MO in the fall of 2019. The conference call for proposals and other conference information will be released soon. For information about the conference, please contact the conference director, Dr. Christopher Bond, at (816) 261-5993 or email at cbond3@missouriwestern.edu.